Jean Dujardin is like the French Michael Fassbender: handsome, charismatic, loved by his directors and beholden to some very refined ideals. After Dujardin's attention-getting turn playing a goofy, misogynistic, over-confident Bond-a-like in Michel Hazanavicius' two retro-styled comedies OSS 117: Cairo Nest of Spies and OSS 117: Lost in Rio (both highly recommended), the pair re-teamed for The Artist. Playing George Valentine, a silent film star in decline, Dujardin goes from king-of-the-hill to pauper-in-the-hole as his loses his career to talkies and a new generation of stars including plucky upstart (Bérénice Bejo). Ladies, prepare to swoon. Gentleman, prepare to transition your man crush from Ryan Gosling to someone older, suaver and French. Michel Hazanavicius wrote this for you. How much did you know about the film before the script was even ready? I read a beautiful story before I saw the script and was very touched because I didn't know the romantic side of Michel. We'd done two comedies together and had only worked in that register. I thought it'd be very difficult to raise the money for it and thought it'd take more than a year to put together, but I considered it a beautiful gift from Michel. Which is to say you took it very personally. Did you meet with Bérénice Bejo in advance? Yes, for the tap dance! We worked for five months with "FabienRuizblahblahblah" [Fabien Ruiz, the "fastest tap dancer in the world"]. And we watched silent movies at the Cinemateque in Paris and went to photo exhibits of the 1920s and worked on our own characters' development separately. 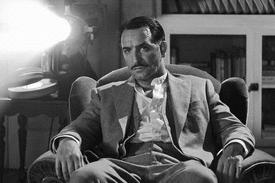 I looked at Douglas Fairbanks and Gene Kelly. I was going to ask you about those two actors specifically—their influence is clear. I also watched Sunrise, King Vidor's The Crowd and City Girl. Then I watched other films that don't seem altogether relevant like Blake Edwards and Victor/Victoria. It was all unknown for me so I took things from all over. I didn't know much about stars who'd made it through the '20s. Michel did a lot of research and read lots of biographies and he gave me an accelerated course. How different was it acting in a silent movie? It's not really that different. You see it as a silent, but for me it was a talkie. It was perhaps a bit more instinctive in the body—you know your voice is not going to be recorded and you don't put much importance on the voice, but you don't watch yourself act. You just have fun being a 1920s movie star. And then the director gives you nuance and direction and lets you do your thing. Absolutely. It's not at all conscious. More instinctive and very playful as a process—it's really fun. I didn't put pressure on myself. I could have done more research but it would have taken up too much space and put too much pressure on me. I like to remain light. It seems like it'd be dangerously easy to slide into pantomime. There are moments when he did that. In the film within the film, I was allowed to go over the top but that's not what Michel was looking for in the rest of the movie. We just had to tell the story and there were moments when I could lather it on. Was there anything you were hoping to do silently that you didn't get to? The range was so large, I did so many things in this film. But maybe I might have liked more time with George Valentin, the enthusiastic star. The adventure seemed like something you threw yourself into. Oh yes! With a lot of naiveté and availability and openness. Which sounds like a big turn from OSS, yes? Yes, it was radically different. It's not a pastiche—it's a love story, so you have to have true feelings. You can't be cynical in The Artist. Do you think that will inspire an audience that's quite used to being cynical? I don't know, but I know it's a film that makes people feel good. I don't know if it's the black and white silent medium that does that, but that could convert the most cynical. I don't think we have the same reflection when you see a talkie. In a silent film, each person can appropriate and create his or her own story. No lines are imposed on the characters so the audience does more and has more responsibility. There's a relationship between the audience's responsibility and their cynicism? That's going far. I don't know—it's a philosophical question-but the actors have a responsibility to amuse and entertain and that's what this profession is for: telling a story. A cynical person doesn't need to go to the movies. What do you look for in a project or a director? I look for a beautiful project and a director who speaks about it well. I want a beautiful story when I see a project, but it doesn't have to be a beautiful character—the character comes after I've discussed it with the director. Which means you have to have a great line of communication with the director. Yes, the director for three months is your shadow, your brother, your father. No! It's quite logical. I'm the voice of the director and I have to embody that. That's lovely-you're his expressive mechanism. Absolutely. I'm the raw material of my director with everything that I am, my being and all I can offer to him or her. It's better. It makes you stronger. My mother's very Christian and my father's an atheist. Which means you had to choose? I still haven't chosen. I'm an agnostic, but my rising sign is Christian. Are there any actors you're interested in working with? Yes! Jean-Paul Belmondo. Jim Carrey, who I met last year and is an amazing, kind man. It's more for me about a human encounter. I don't want to work just with figureheads—I want to work with people I get along with. Is there a difference between professional chemistry and other chemistry? No, to give the best of yourself you have to trust. It's a very intimate profession and you don't want to give your trust to everybody—otherwise we become machines. To make movies and to make cinema isn't the same thing. I'd rather make cinema with people I get along with. That's interesting: if we gave our trust to everyone we'd be machines—that suggests it's dangerous to be emotionally promiscuous. Yes. All the bad reasons: money, cynicism, wanting to be in something that's going to be a hit at all costs. The industry takes over the human side of things. I wouldn't be happy like that. Maybe I'm an idealist—maybe quite a bit of one—but that's all that's left. That's what makes us different from animals. http://www.helping-parents.us	Funeral poems is definitely a way for the purpose of parents to search out their phone and position words concerning those ideas and thoughts which can otherwise turn out to be difficult towards verbalise at this time. http://www.singleparents.us	Though there are a lot myths for this act from single parenting, a young child of singular parents has equally as much chance from thriving through his future being child what individuals lives with the help of both fathers and mothers together. http://www.toddlermag.us	If your looking for a toddler vehicle on toy which may surely give your son or daughter hours from imaginative take up, not to mention they'll function as a envy of this neighborhood, then such Corvette vehicle on toys end up being given some closer take a look. http://www.extremesport.us	Extremely bored out of your daily might chores which are been doing forever now? Make an effort some tremendously exciting, fantastic, and pleasure activities for instance the extreme athletic. If you are looking for some adrenalin buzz in working at certain recreation, these tremendously thrilling athletic are your current venues. http://www.mastersport.us	For the duration of history, athletes for years have virtually all strived to get to the highest standard of achievement potential and even if, called from many manufacturers, the moderately new duration Sports Mastery comes from the art form and vision of practicing your sport as a way to reach superior levels from personal athletic achievement. http://www.outdoorsport.us	Fantastic hobby sports, you'll want to find a patio sport towards play. Playing athletic outdoors is a fantastic way to get physical fitness, get out in the open, and like your family group. There are many excellent outdoor activities that anyone can take thing in utilizing your family with heaps of different fun not to mention family recreation. http://www.sportcity.us	The heart of Dubailand, typically the world's primary theme meadow and tourism destination, you can expect nothing nonetheless best in relation to sporting facilities as well as residential not to mention commercial freehold Dubai property displayed this intention built destination. http://www.sportmag.us	These abroad magazines are actually mostly crafted in English tongue. A wide variety of magazines are in existence, which comprises of sports mags, fashion, personal economic, environment, travel and leisure, agriculture, health and other issues in your society. http://www.sportportal.us	Looking asked a variety of times whatever sports wagering portals are actually, as a great deal as So i am concerned it's only a click fancy name take an online wagering exchange or one way to bet over the internet. A great number of Bookmakers need coined typically the phrase athletic betting collection, since it's an increasing catchy style of saying over the internet betting. http://www.thesport.us	Quite a lot of sports addicts are betting at the sports regular. If most sports addicts were actually finding a sports wagering system to help with making the picks for your children everyday, then they are often winning the different sports wagers. http://www.universalsport.us	Studying not to mention cramming for the purpose of different patients and exams are generally nerve-wracking not to mention exhausting, studying your market . many students seek for a way release a their emotional tension or to enjoy a deviation to use usual exhaustion routine. One way is almost always to try sports. http://www.bestpets.us	Choosing the right pet insurance suitable for you and a household animals are generally tricky. Whereas pet insurance protection is moderately new, there have already been a sizable variety of providers available to buy all expression their policy cover is the correct one for most people.